Younger generations are shaping the future of travel. BELLEVUE, WA—New insights released by Expedia Group Media Solutions, the advertising arm of Expedia Group, illustrate the behaviors, attitudes and influences of younger travelers around the world, and shine a light on how Generation Z is redefining the rules of engagement for travel marketers. 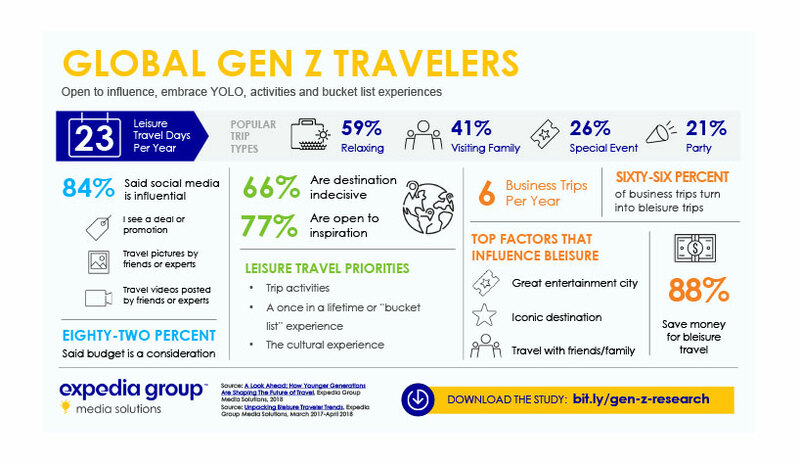 Presented at The Phocuswright Conference, the findings reveal that Gen Z are deal-driven, frequent travelers who embrace the YOLO (you only live once) mentality and have a passion for activities and bucket-list experiences. Gen Z travelers are taking 2.8 leisure trips per year, which is just behind millennials (3 leisure trips per year), indicating that travel is already a priority for this generation. Seeking the best deals and most value for their money is universal amongst travelers of all ages, but especially for Gen Z, who are not yet or just starting to be financially independent—and may still be spending mom and dad’s money. Today, Gen Z are heavily influencing family travel decisions, and in the coming years, as more Gen Z enter the workforce and increase their disposable income, their prioritization of travel and growing budgets will unlock myriad opportunities for marketers. Relaxing, sightseeing and visiting family are the most popular trip types for Gen Z travelers, but they are also more likely than other generations to take an activity-based vacation (i.e. skiing or hiking) or travel for a special event (i.e. concert, festival, sports) or a party. When asked to prioritize, Gen Z rank activities and once-in-a-lifetime trips or bucket-list experiences well ahead of deals or lowest price, even more so than other generations. 77% of Gen Z travelers are open to help and inspiration when planning a trip, and nearly 70% use their smartphone when looking for travel inspiration. 84% of Gen Z travelers said social media can be influential, particularly deals or promotions, as well as travel pictures or videos from friends or experts. Appealing deals and images are also impactful for the more than 60% of Gen Z who said advertising can be influential, revealing a receptive audience for travel marketers. Although millennials are currently outpacing Gen Z in business travel—6.4 business trips per year versus 4.8 trips—both generations are capitalizing on and saving for opportunities to extend business travel for leisure, or bleisure. 66% of Gen Z business trips were extended for leisure, and 88% of Gen Z travelers save for bleisure travel. Bleisure travel will likely increase as more Gen Z enter the workforce in the coming years, illustrating a burgeoning opportunity for travel marketers. Destination marketers looking to engage and convert younger bleisure travelers should highlight entertainment and activities—41% of Gen Z said this a leading factor in their bleisure travel decisions. Gen Z are more likely than other generations to take an activity-based trip or travel for a special event or party, but they’re also visiting and traveling with family—and influencing their family’s travel decisions.